Abstract. Spatially distributed detection of bedrock erosion is a long-standing challenge. Here we show how the spatial distribution of surface erosion can be visualized and analysed by observing the erosion of paint from natural bedrock surfaces. If the paint is evenly applied, it creates a surface with relatively uniform erodibility, such that spatial variability in the erosion of the paint reflects variations in the erosivity of the flow and its entrained sediment. 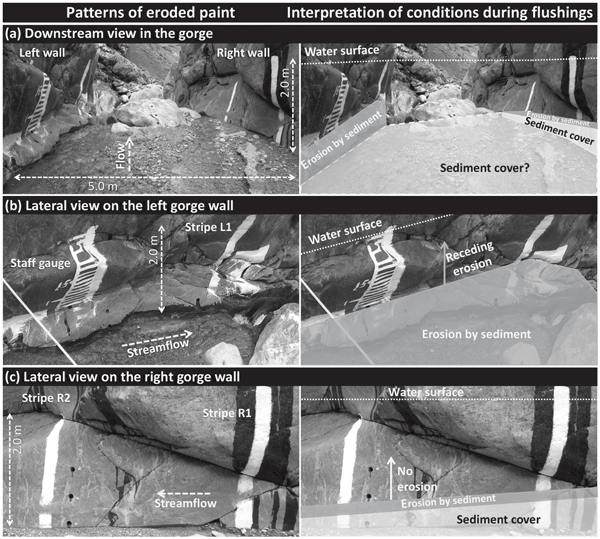 In a proof-of-concept study, this approach provided direct visual verification that sediment impacts were focused on upstream-facing surfaces in a natural bedrock gorge. Further, erosion painting demonstrated strong cross-stream variations in bedrock erosion, even in the relatively narrow (5m wide) gorge that we studied. The left side of the gorge experienced high sediment throughput with abundant lateral erosion on the painted wall up to 80cm above the bed, but the right side of the gorge only showed a narrow erosion band 15–40cm above the bed, likely due to deposited sediment shielding the lower part of the wall. This erosion pattern therefore reveals spatial stream bed aggradation that occurs during flood events in this channel. 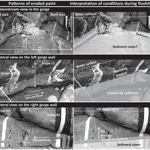 The erosion painting method provides a simple technique for mapping sediment impact intensities and qualitatively observing spatially distributed erosion in bedrock stream reaches. It can potentially find wide application in both laboratory and field studies. How to cite: Beer, A. R., Kirchner, J. W., and Turowski, J. M.: Graffiti for science – erosion painting reveals spatially variable erosivity of sediment-laden flows, Earth Surf. Dynam., 4, 885-894, https://doi.org/10.5194/esurf-4-885-2016, 2016. Spatial bedrock erosion data from stream channels are important for engineering issues and landscape evolution model assessment. However, acquiring such data is challenging and only few data sets exist. Detecting changes in repeated photographs of painted bedrock surfaces easily allows for semi-quantitative conclusions on the spatial distribution of sediment transport and its effects: abrasion on surfaces facing the streamflow and shielding of surfaces by abundant sediment.